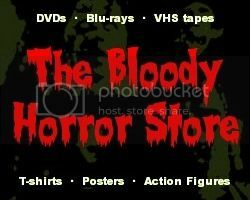 As you know, I sometimes like to use this blog to talk about other things besides horror movies. This is one of those times. What you may not know is that I absolutely loathe Hewlett Packard and all of its products. I'm not too keen on their employees either after one of the morons insulted me for no good reason when I was simply trying to earn a few bob by working for a security firm at one of their warehouses back in the early '90s. Actually, it's probably entirely because of that idiot that I've hated Hewlett Packard ever since. I had enough to put up in my life with without that douchebag getting gobby in an attempt to compensate for his own inadequacies. It may have been a long time ago, but I don't forgive or forget anybody ever. Now I have another good reason to despise Hewlett Packard, i.e. the way they try to rip off their customers with the price of ink cartridges. To be specific, the HP56 has three times the ink of the HP21, is exactly the same size and shape externally, but costs less than a HP21 and won't work in any printer designed for a HP21 cartridge. Having been unfortunate enough to acquire one of their "budget" printer/scanner/copier machines, I tend to run out of ink in the thing pretty often. So I thought I'd buy a HP56 cartridge a couple of years ago on the advice of a Wal-mart associate who actually had no idea what he was talking about. Of course it didn't work although I even took the stupid thing back once for an exchange thinking that it might be a badly manufactured cartridge. The replacement didn't work either, and I was too ashamed to go back to Wal-mart again even though I could barely afford to waste the money. I'm a good customer and never return things because of my own stupid mistakes. Suffice it to say that the HP56 cartridge remained in my closet wrapped up in cling film (saran wrap) for the last two years, and I continued to buy the occasional HP21s instead. Finding myself without ink for the last 6 months, in desperation, I finally decided to attempt an experiment. Basically, I cracked open my old HP21 cartridge and the unused HP56 to see what was inside. There's nothing special except a sponge, but the HP56 fills the whole cartridge case while the HP21 has a plastic barrier moulded inside and only holds a sponge which is a third of the size. You can guess what I was thinking, right? Just swap the sponge. Ripoff version of the HP56 with a smaller sponge inside. Here's how to save at least $40. 1. Pop the tops of the new cartridge and the old one with a screwdriver. Work the tip of the screwdriver carefully around the edges until you hear snaps. The top of the HP21 is far easier to remove than the top of the HP56. You'll probably have to break the latter. I eventually grabbed a hammer and used the screwdriver as a chisel. It doesn't matter because you'll never use the HP56 casing again anyway. 2. Hold the HP56 sponge with some cling film (or put on some disposable gloves) so you don't get ink on you, then cut it into 3 with a very sharp knife. A paring knife from the kitchen is ideal although it's best to put some cardboard under the sponge as you cut it rather than a chopping board which will stain. The ink washes off your fingers easily enough with warm soapy water, but it will stain clothing and anything else. 3. Having cut the sponge, remove the dried-up one from the HP21 and put a 1/3 of the HP56 sponge into it. 4. 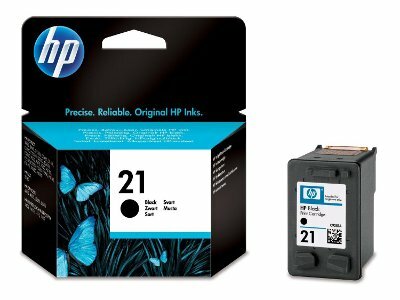 Snap the top back on the HP21 cartridge and put it back in your printer. It shouldn't need any glue to hold the top on, but you can do that or use sticky tape if you are a bit paranoid. The cartridge sits upright anyway and there's nothing to spill out of it. 5. Put the other 2/3 of the HP56 sponge back in its casing, wrap it up with cling film and store it somewhere for later use. Movie reviews will recommence shortly.